The first-generation Surface RT didn't have nearly as many sales as Microsoft expected, and the Windows-on-ARM platform, Windows RT, was abandoned by pretty much every OEM that had invested on it. 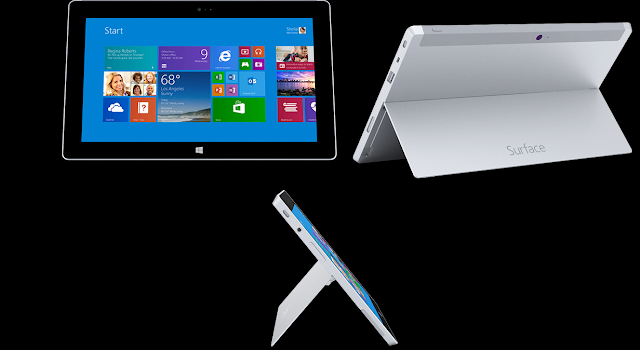 Now Microsoft is trying to save its tablet platform with a new line of Surface tablets. The Surface RT successor, the Surface 2, adds a high resolution display and a powerful SoC in a thinner, slightly lighter chassis. Here's hoping that these changes are enough to bring Microsoft into relevance in the tablet market. The new Surface 2 is appreciably thinner than its predecessor. At 8.9mm, it's just as thin as the Google Nexus 10. The back casing is reminiscent of the original Surface RT, as it is still made of durable "VaporMg" magnesium, this time, however, the metal back has a much lighter gray color, as opposed to the Surface RT's dark gray. The back camera has gone from 1.2MP on the original Surface RT to 5MP on the new model, with 1080p video capability. The built-in kickstand makes an appearance again, but this time it can support the tablet at two different angles, making it way more convenient to use. The ports on the tablet include a full-sized USB 3.0 port, a microSD card slot, and on the bottom, magnetic pins for the keyboard covers. The front is pretty much identical to the original Surface RT. The 10.6" ClearType 1080p display is surrounded by large enough, though not too large bezels, and above the display is the 3.5 MP rear camera which also features 1080p video recording. Below the display is the usual capacitive Windows button. The Surface 2's display, like the Surface RT's, is pretty large for a tablet. At 10.6 inches, it's slightly larger than the usual Android tablet. For that reason, it's pretty hefty, weighing 675g, even more than the iPad 4. The display features ClearType technology, also used in last-year's Surface tablets, and that means that the display's various layers are laminated into a single layer, reducing glare. This should be very appreciable, especially when trying to use the tablet outdoors. The 1080p resolution isn't the highest resolution on a tablet, since the latest iPads and Android tablets have considerably higher resolutions, and the larger-than-usual display results in an ok pixel density of 208 ppi. It may not be the highest pixel density on a tablet, but it's still very crisp. Under the hood is the powerful NVIDIA Tegra 4 processor. That means the Surface 2 is powered by four Cortex-A15 cores clocked at 1.7GHz and a beastly 72-core GeForce GPU. The powerful SoC is fitted with 2 GB of RAM. Though the SoC is very powerful, Microsoft still claims up to 10 hours of video playback for the Surface 2. The ARM-based SoC means the Surface 2 runs on the Windows 8.1 RT operating system, which unfortunately didn't see much success last year. Windows 8.1 RT is essentially just like Windows 8.1, except it can only run apps from the Windows Store, and cannot run legacy Windows Apps. Unfortunately, the Windows Store has still not matured very well, and is missing some essential apps, like Instagram, which might make the operating system a deal-breaker for people who want to do more than web browsing and working with Office 2013.